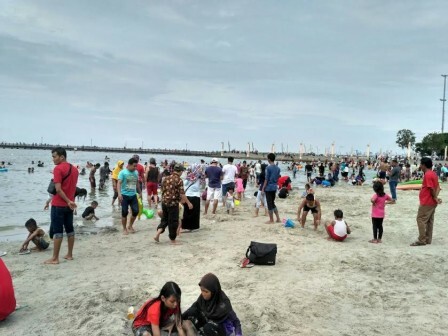 Taman Impian Jaya Ancol, North Jakarta is still the favorite tourism are for the capital city citizens, especially during Christmas and New Year holidays this year.
" The nuance is good for holiday"
Up to 2 PM, 65,500 people have arrived at the location. Irna Susilawati (25), one of visitors, admitted the location offers many entertainment for her family. “The nuance is good for holiday,” she said, Sunday (12/25). Meanwhile, Corporate Communication Ancol Taman Impian, Rika Lestari, said her side targeted 100 thousands people today. For tomorrow, Monday (12/26), her side targets 225 thousands people. “Many entertainments are prepared for the visitors such as newly-open dolphin bay, Ancol water show, and so on,” she said. Her side also prepares five health posts which guarded by five personnel. “We’ll improve cleanliness and traffic management,” she promised.